After more than 20 years as part of the Insurance Industry, Dave realizes that his most important tools to serve his clients are his ears and eyes. Listening to his clients’ needs and seeing the opportunities to meet them are foundational to Dave’s business practice. Having lived and worked in Orange County his entire life (except for his four years at USC where he graduated with a degree in Journalism/Public Relations), Dave considers himself privileged to work with clients within a variety of industries and locales within California and nationwide. Initially and primarily involved with Employee Benefits, Dave also specializes in Commercial Property & Casualty and Workers Compensation. 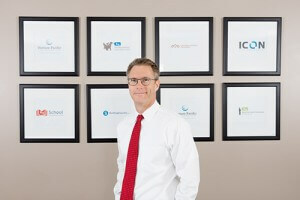 As a first-hand witness to more than 2 decades of changes within all aspects of the insurance industry, Dave is dedicated to being a reliable source of current information and a steady encouragement to his clients. While many of his clients accuse him of not having a life beyond insurance, Dave enjoys volunteering for a local Senior Center’s Meals on Wheels Program as well as Stand Up Paddle Boarding. Dave and his wife Laurie just celebrated their 25th wedding anniversary. They met while riding camels in Cairo, Egypt. It’s a great story – be sure to ask him about it!